Pearls are the definition of classic and elegant and when paired with a line of Cubic Zirconia stones set in 18k white gold, these are guaranteed to turn heads and make you sparkle all evening! SATISFACTION GUARANTEE - 30 Days Money Back Guarantee.If there have any question please feel free contact us firstly. 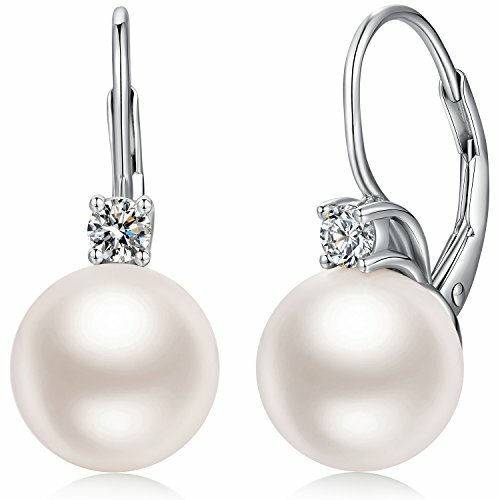 【SIMULATED IMITATION PEARL】Elaborately handpicked AAA+ quality 9-10mm white simulated imitation pearl dangle earrings for women girls. Featuring simulated imitation pearls with a high luster and a high-quality shine that will hold their beauty for years to come. 【HYPOALLERGENIC】Environmentally friendly, Lead-Free & Nickle-Free, no harm to health. Our elegant fashion pearl drop earrings are suitable for almost all of sensitive ears. These are the top earrings for daily wear. 【LEVER-BACK DESIGN】Our products are made of 925 sterling silver and lever backs design, bending is common. You can also adjust the curvature of the earrings for different angle of the cartilage. 【FOUR PRONG SETTING】Above each freshwater pearl accented with a single brilliant round cut 1/10 ctw cubic zirconia beautifully & precisely set in a 4 prong setting. Enjoy the dazzling sparkle, and stop to worry about losing your expensive diamond. 【ELEGANT GIFT BOX】Come with a beautiful gift box, you can send it directly to your loved ones. Like lover, girlfriend, wife, fiancee, mother, your friend, a unique present for Valentines Day, Mothers Day, Anniversary Day and Birthday to express your sincere love.【SATISFACTION GUARANTEED】30 Days Money Back Guarantee. If there have any question please feel free contact us firstly. If you have any questions about this product by Han han, contact us by completing and submitting the form below. If you are looking for a specif part number, please include it with your message.